Libyan rebel forces have looted shops, homes and medical facilities in some of the towns they seized in the country's western mountains, Human Rights Watch has said. In several towns, the rebels torched homes believed to belong to supporters of Muammar Gaddafi, the New York-based group said on Wednesday. Since the uprising seeking to end Gaddafi's 42-year rule broke out in mid-February, armed rebels have seized control of much of the country's east and set up an administration in Benghazi. They control the coastal city of Misrata and much of the Nafusa mountain range south-west of Tripoli, where they have expanded their control with a string of victories in recent months. Human Rights Watch, which based its report on interviews with local fighters and residents, called on rebel commanders to hold their forces responsible for damaging civilian property. "Opposition forces have an obligation to protect civilians and their property in the areas they control so people feel they can return home safely and rebuild their lives," said Joe Stork, the group's deputy Middle East and North Africa director. Rebel commanders could not be immediately reached for comment. Human Rights Watch quoted one commander as acknowledging that abuses had taken place, but denying that such acts were policy. 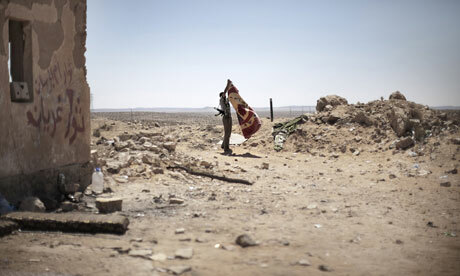 "If we hadn't issued directives, people would have burned these towns down to the ground," the group quoted Colonel El-Moktar Firnana as saying. Gaddafi's forces in the area have been accused of indiscriminate shelling of civilian areas and laying land mines. [Ron: This LIBEL is baseless Yiddish propaganda!! ].